East of Sacramento, just a few minutes from I-80 on the side of a busy street in the town of Rocklin, is an old granite quarry called Deer Creek Park. 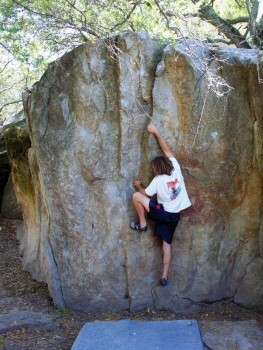 It sports about 50 fun and challenging vertical to slightly overhanging problems. A small grove of trees gives shade in the summer and clean flat landings with pieces of carpet straight out of the old school keep the feet dry in between tries. The granite from this quarry was used to build the State Capitol as well as parts of the Central Pacific Railway. About 10-20 good lines from VB to V-hard are concentrated into the main area with more on the surrounding boulders. Bouldering and even a little toprope climbing has been enjoyed here since at least the 1970s. Recently psyched locals like Vic Copeland filled in the gaps, finished off long standing projects and envisioned and climbed some new classics. One of the old school problems that is still classic to this day is the splitter (piton scarred or quarried?) 5.11 finger crack on the far right side of the main wall. Smoke Rise Up V8X, Quarry Pinch V8, Sit Carter Left V7 or Right V5, Deer Creek Slab V5, Finger Crack V3, Crack Face V0 and Slab Crack VBX! Which SuperTopo guidebooks cover Rocklin (Deer Creek Park)? Kelsey Howard climbs Crack Face (V0).